I met up with Misty, Adam, and sweet Everett, on what was to be the last sunny day before the wettest winter in 75 years was to hit Portland. We hopped in their pickup truck and headed out to their family Christmas Tree Farm, where we promptly planted ourselves in a cove of firs for snack time (toddlers = forever snack time!). After we hunted for the perfect tree, we headed back to their cozy and festive home for some cookie baking a story reading. This gorgeous sunny morning kicked off the holiday season for me, and I couldn't be more grateful to this family for inviting me in to capture this sweet tradition. In August of 2014 I reached out to Hannah and Kelty (otherwise know as the forces behind The Weaver House) because I knew I wanted to photograph them. We had some mutual friends, I had followed their work, and their Instagram feed, and I couldn't sit by imagining anymore, I needed to make something happen with these ladies. And because sometimes the universe winks a magical nod in my favor, they responded by telling me they'd just been talking about hiring me. They might have even used the term "kindred spirits" in their initial reply. So we scheduled a family session, and then we rescheduled approximately 100 times, because LIFE got in the way it likes to. But in yet another instance of magical timing, when I did finally get my camera on them (and their girls, and their menfolk), it was on what ended up being our last warm and gorgeous October evening, one that would have made Anne Shirley swoon. I drove home from that session thinking that if I hadn't just created some of my best work, I was going to have to question my future as a family photographer. You can decide for yourself what you think, but I'm pretty damn pleased with these results. It's delightful when your imaginations come true, isn't it? So Archer, who's nickname is naturally Arch, photographed with his family (and let's be real, this is Archer's show and we're just here to be entertained), ahem, anyhow, doing this session at Arch Cape seemed meaningful enough, or at least fun, but when Alexis told me that they were at Arch Cape when they found out that the baby in her belly was a boy, boy number 2 (Bram), well then I knew we had to make this session happen. And then we decided on sunset, and a fire, and s'mores, and well aside from poor Bram being a tad on the chilly side, it was an absolutely perfectly wonderful exactly-what-I-want-to-do with my Saturday evening, photo session. Sometimes the hardest posts to write are the sessions I loved the most; This is definitely one of those cases. Bee contacted me through Instagram about booking a session when we were on our California road trip in June. She told me she had 9 babies (NIIIIIINE) and wondered if that would be too much for me. She said all kinds of wonderful things about my work, and then she said the magic words: "I kinda love the crazy and different so even dressed in what they choose and not even looking but just being in the frame doing whatever kinda speaks to my heart..." (she also told me she had a daughter named Posie, so yeah: sold, sold and SOLD). We met at their home in Los Gatos, California on a hot-as-blazes kind of afternoon. Baby Otis napped, while sweet Meme gave me a tour of the house, and Posie flipped me all kinds of sass, that made me grin from ear-to-ear. I have never in my life interacted with someone with the same name as mine and it was an interesting experience indeed, but she absolutely owns the name and has the perfect personality to accompany it. She made me proud in the two hours I was with her, and she isn't even my kid. Ha! I could draft paragraphs about each of the nine children. Truly, the thing that I took away from this session more than anything is that raising nine incredibly kind, respectful, funny, and unique people is entirely possible. I'll be honest, I expected this session to be chaos and hard work, and while it's true we may have temporarily "lost" one of the children (side eyes to you, Amos), overall the afternoon we spent together was completely enjoyable. I am in awe of this family and their seemingly effortless bond. I was honored to be invited into their world and asked to capture it. I sure hope I did them justice. There are four things I want to share with you from this session. One: After Meg booked her photo session, she told me that her family's favorite thing to do on the weekend was FIB (Family In Bed), so naturally that is where we started. Not dressed up fancy sitting on top of a made bed, but as they normally are on the weekend, all cozy in jammies, reading and snuggling under the blankets. And jumping on the bed, of course. Two: She also shared that their eldest son was obsessed with all things Super, and as a result the family had acquired matching super hero capes, thanks to a very crafty grandmother. So yep, those were going to have to be included too! Three: Meg told me that she picked up my card at a Portland toy store, while visiting from San Francisco THREE YEARS AGO, and hadn't forgotten about me after they finally moved here. I mean, I don't even know what to say about that except, WOW. Thank you, Meg. The last thing I want to share about this session is Meg herself, because I've re-read it at least ten times and I smile each time I do: Thank you for so miraculously and perfectly capturing the spirit of our family. These photos are a perfect reminder that we are just fine, and absolutely perfect thank you very much, exactly the way we are. I love that you captured that, not anything about who we are trying to be. For me, and for our kids, these will serve as a wonderful reminder to be just exactly who we each are. My friend has a hysterical amazing boyfriend who is always telling her "you do you, girl, you do you." Thanks for capturing the spirit of us doing us. - Meg, also know as "Super Mom!" Kelly and I met at Field Trip last year, well that's not quite right, we "met" in InstaLand sometime the year prior, but became true friends after spending some real time together. 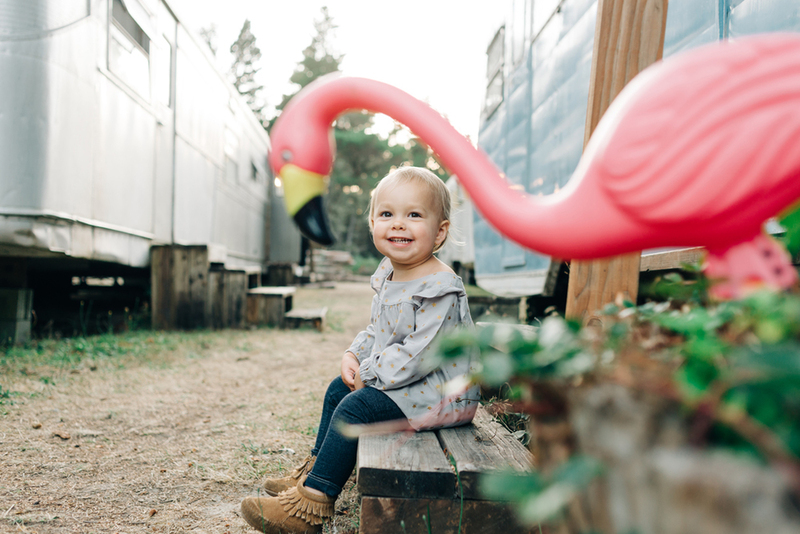 Because she and her darling family live in Santa Barbara, they were a natural choice for me when I was considering a live family session for my class this year. I also liked the idea (from a teaching perspective) of working with a dynamic family, one with step-children and half siblings, ranging in ages from 4-14, in a location I had never worked, under the bright hot California sunshine (alright, so I could have lived with less overhead sun, but we dealt with it). And lucky for me (and all the rad peeps who signed up for my class) they were totally game for driving into El Capitan Canyon and casually having their family portraits made in front of 40+ strangers. I wasn't sure how that would all go down, but I'd like to think these photos don't show anything other than a beautiful loving family in a gorgeous area of California. And while I would also like to take credit for that, at least some props are owed to this crew, because they were just completely relaxed and up for whatever I threw their way. And for that (and the pizza Will made me a few nights later, but that's another blog post) I will be forever grateful. I did feel the need to take a tiny breather mid-session, just to regroup and make sure I was doing everything I should; I snuck off to the bathroom only to be greeted by this pennant. YOU GOT THIS. I chose to believe that little green triangle. PS- I don't have any upcoming workshops scheduled at this point, but I am about to teach another round of Driving Your Business for The Define School. Registration is open now, and classes begin May 6th. If you'd like to hear what previous students of that class have to say, you can read reviews on this cool new site. Oh, even though I know I've already said too much, I also have to share my new page with info on all my teaching gigs here. Okay okay, that's it. Smooches! Shoshana is a mama, attorney, photographer, and all around goddess, living in New York City, who just happened to find herself and her cast of characters, ahem, I mean family, in Portland last summer; And even better, they asked me to capture their magic while they were here. I know, I am just beyond lucky. ANYWAY, because I'll be seeing two-thirds of these peeps at Field Trip later this week (whoop! whoop! happy dance), it feels like the perfect time to share this session. Here's a session from summer that I never did blog. Seeing as how it has a bit of a driving theme, and I'm getting ready to teach my second round of Driving Your Business for The Define School, well it seemed like a good a time as any to share this fun session. Now please do me a favor and indulge me by letting me talk about teaching just for a moment (or don't, go ahead and click away, I'll try not to get my feelings hurt). When I signed on to teach this class, I really had no idea what I was getting into. I knew I had some things to say, maybe a few gems to contribute to fellow family photographers, but I didn't really give a lot of thought to whether or not I would enjoy the process. But OH did I enjoy it! And not just the writing of the class - though that was a fun challenge to embark on (side note: when I started writing I thought surely I wouldn't be able to fill more than a few pages with my "method." But when I finished, I had typed up something like 30 pages. I guess we know I've never been short on words, but I was pretty damn surprised and a little proud of myself!). Ahem, digression is something else I'm quite good at... What I really loved about teaching the class for Define was the community of photographers who I got to engage with on a weekly basis. I loved sending out the lessons and getting responses; working through questions, tackling specific problems, and sharing thoughts and ideas as a group. And I LOVED reading the student's assignments as they came back - seeing how they took my words/ideas/process and applied it to their own work. It was incredibly rewarding and I loved every minute of it. The online group forum created by Define allows everyone to interact, hash out ideas and problems together, and be "in class" in a way I hadn't experienced before. I really felt like I got to know a lot of the people in my class over the four weeks we were "together" and I feel like I grew from it as much as [I hope] they did. But sheesh, enough of me talking about ME. Here's a few quotes from my students, just so you know I wasn't the only one who enjoyed my class. Ha! This class has pushed me to create a very clear vision of the direction I want my business to go in as well as how to handle my clients so that we can all get the most out of our time together. It has given me the steps I need to take to create a better flow for my business and my approach with clients. I loved the personable way in which you presented information. It made it fun and easy to process but also got me thinking. You didn't just hand out answers but provided tools and opportunities to help us find what works best for ourselves and our business. You're a peach. - Lauren L.
I am so happy that I chose to take Posy Quarterman's class at DEFINE! Being knee deep in a full time photography career, her class was EXACTLY what I needed to help me get on track, stay focused and get organized. What I loved most about it was that week to week the tasks were doable not overwhelming and her warm and supportive nature was just what I needed to reassure myself and stay on task. I have used her tricks and tips since her class and have never been more successful! I highly recommend this class for anyone who is trying to start a photography business, already testing the waters, or even if you are already there and just need someone to show you how THEY handle the business side of things. With truly helpful tried and true suggestions to help you streamline your business, this is the class for you if you are aiming for the stars! – Audrey B. Honestly, the preparation that you’ve presented (and the actual doing it, of course) has been a life changer. I would say this class has been huge for me; It’s opened my eyes and has seriously helped me feel more confident and prepared. In turn, I'm much more able to be ME and fully present with my clients from the moment I arrive. THAT was AMAZING. - Amy P.
For me this class was hugely informative; I feel like as I continue to shoot and work towards my own honed style I have the tools needed to run and manage my business successfully. - Toni E.
Classes begin January 5th and registration for those classes opens Monday, December 15th! Apparently January is the quickest block to sell out at Define, so mark your calendars. And here's one more incentive: investing in a January class during December registration will reduce your tax liability for 2014. I'm all about that. Wahoo! I hope to "see" you in my class in January! This is what your childhood looks like when your funny, gorgeous, hip-to-the-core, and extremely loving parents, run a bustling popular restaurant in N.W. Portland; Your downtime at home will undoubtably include pillow fights, tickles, ukulele strumming, ivory tinkling, block tower building while listening to T-Rex, and tormenting, ahem I mean loving-on, your two little pooches, Bradley and June. And the times you're not at home? Well when your book-loving mama isn't taking you to the library, or your mellow little playgroup, she'll often bring you in to your family restaurant to hang out behind the scenes with your pop, while she enjoys a burger and cocktail in peace. You've got it pretty good kid, and your parents, well they're working damn hard to make sure you don't feel the pressure of restaurant life, and as far as I can tell, they're doing a damn fine job. Andrea, Aaron, and Ewan, I sure adore you three; I feel quite lucky to call you friends, and I was honored to spend a morning with you documenting your beautiful life and love for each other.